Scotland’s Transport Minister, Derek Mackay visited Arran yesterday to see plans to deliver an £18 million upgraded harbour at Brodick, and hear the latest on the delivery of a new vessel for the Ardrossan-Brodick ferry route. And following the introduction of the Road Equivalent Tariff to Arran routes in October last year, part of a wider commitment to roll out reduced fares across the Clyde and Hebrides during the lifetime of this Parliament, carryings have increased significantly. Minister for Transport and Islands, Derek Mackay said: “I was delighted to travel on one of our busiest ferry routes to visit Arran and hear from partners taking forward plans which will deliver a new upgraded harbour for the island’s capital, worth £18 million. “Arran is one of the true gems of our islands - a real favourite with tourists - which is why partners are pressing ahead to deliver the upgrades by the end of next year. “Thanks to partnership funding, work is under way to upgrade Brodick Harbour, with plans for a new pier, a new terminal building, improved passenger access, and a deeper berth to allow a greater variety of vessels to dock. The bus terminal will also be upgraded to ensure improved onward connection to all corners of the island and its wonderful assets. “But we want to do more for Arran. The Road Equivalent Tariff (RET) which delivers reduced fares for passengers, cars and small commercial vehicles, has been popular on other routes, and since its introduction to Arran routes last October, is also proving to be a real success. “With car fares down by half and passenger fares down by around 30%, we have seen a real bounce in ticket sales. Passenger numbers on the Brodick route are up 10%, with car carryings up by more than 50%. The Lochranza route is up by over 50% for both passengers and cars, which can only be good news for the island economy. More communities will see the benefits of RET when the roll out to all Clyde and Hebrides routes is completed in October this year. “And procurement of a new vessel is also under way for delivery in 2017 completing a package of ferry infrastructure improvements which will benefit Arran. With popularity of Arran routes on the up, the new vessel will be procured with capacity, resilience and improved passenger experience in mind, benefitting both locals and visitors alike. Brodick’s port facilities are around 40 years old and reaching the end of their serviceable life. The terminal redevelopment is included in the Scottish Government’s Ferries Plan (2012). The Brodick Harbour Redevelopment Group was established in June 2013 to deliver the new infrastructure. The Group includes CMAL, Transport Scotland, North Ayrshire Council, Visit Arran and Highlands and Islands Enterprise, and has worked in partnership to secure the funding to deliver the right solution for the project. A commitment of £1.2 million has been received from North Ayrshire Council, SPT will deliver a proposed £1 million contribution, with the balance of the funding from Transport Scotland and CMAL. RET was introduced on routes to Arran in October 2014. On the main Ardrossan–Brodick route, car fares are over 50% cheaper compared to a standard single for the previous winter, whilst passenger fares are almost 30% cheaper. Fares on the Lochranza-Claonaig route have also reduced significantly. The procurement process to build and design two new ferries for use on the Clyde and Hebrides Ferry Services network was launched on 15 October 2014. The successful bidder will undertake detailed design and construction work of two passenger/ freight /car ferries of 100 metres length overall, as well as testing, equipping, launch and delivery. The first vessel is to be delivered by the end of 2017 with the second vessel to follow shortly after. 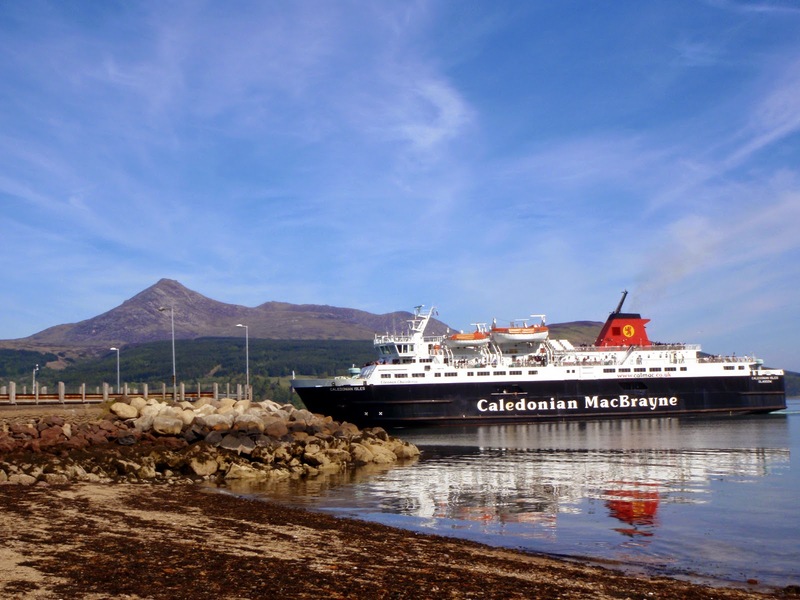 The ferries are being designed to provide a fully flexible year-round service for Arran and the Uig Triangle, subject to final review by CalMac Ferries Ltd, CMAL and Transport Scotland. The vessels which are being replaced will be cascaded throughout the network. North Ayrshire Council is a member of the Elite Ayrshire Business Circle.